That’s what comes to mind when most people think of Joan Crawford, more so than the professionalism and remarkable performances that mark her four decades long career. Shortly after her death in 1977, Crawford’s adopted daughter Christina published “Mommie Dearest,” a memoir detailing her mother’s alleged abusive nature, alcoholism and neuroses. Katharine Hepburn, Myrna Loy, her first husband Douglas Fairbanks Jr., her two youngest daughters and others close to her denounced the book. But with Frank Perry’s 1981 film adaptation, featuring Faye Dunaway’s shrieking, hollow, larger-than-life performance, the damage was done. In just 129 minutes the film unravels what Crawford had been building for herself since first gracing the screen in the late 1920s. It turned the image of Crawford in the cultural imagination into a monstress, a soulless camp icon to be mocked and reviled but rarely respected, and a cautionary tale of what happens when women put their careers first. This misses how layered and beguiling Crawford could be—she’s a woman who embodies all the dreams every young girl has when she looks at the glimmer of Hollywood and thinks “I want to be a star!” and the cold pangs of yearning when the spotlight leaves. The image I hold of Crawford is one crafted from her various roles and interviews that have far more complexity than “Mommie Dearest” and her current legacy do. She’s one of the finest examples of how stardom works and is a powerhouse of an actress, despite the sexism and obstacles she faced from the same industry that made her a starlet. Although many stars from classic Hollywood struggled as they aged and the studio system that shaped them went to rot, actresses carried a heavier burden. Towards the end of Marlon Brando’s life he was an absolute embarrassment professionally and personally, but that hasn’t stopped new generations of actors from exalting him, as if screen acting didn’t matter until he showed up. The 1962 Robert Aldrich film “Whatever Happened to Baby Jane?” reinvigorated Crawford’s career, along with that of Davis, her co-star. It also spawned the dubious “hagsploitation” genre, which is exactly what the word conjures. There is a visceral thrill in watching these aged divas and older cinematic titans hash it out in horror rather than be regulated to playing bloodless, supporting roles far beneath their talents. Films like “Hush ... Hush, Sweet Charlotte” (1964), starring Davis and Olivia de Havilland (in a role originally meant for Crawford) let these actresses form fascinating roles, and often disregard the rigorous expectations of beauty in order to deconstruct their own images in a metatextual manner. But the films in this genre often look down upon the leading characters rather than empathizing with them. In the last few years of Crawford’s career we see this strain of pure Grand Guignol. In films like 1964’s “Strait-Jacket” and 1970’s “Trog” (her final screen appearance), Crawford is positioned as a punchline. Crawford took a dim view of her later career after “Baby Jane” saying, “They were all terrible, even the few I thought might be good. I made them because I needed money or because I was bored or both. I hope they have been exhibited and withdrawn and never heard from again.” She stayed in the public eye thanks to her later film work and a prolific television career that included guest spots on “The Man from U.N.C.L.E.” (1967) and “Night Gallery” (1969). Her later career is spotty at best, rarely living up to what she was still capable of as an actress. These failures aren’t enough to undo her many accolades and amazing dramatic performances. They have nothing to do with Crawford as an actress. They are a byproduct of an industry that fails to see the rich interior lives of older women and fails to offer roles worthy of their skills. It’s ultimately “Mommie Dearest” that cemented Crawford’s legacy as a campy joke. The very end of her career highlights a grotesque femininity that Christina Crawford’s book and Perry’s film expand on. I’m not interested in parsing out what may or may not be true about Christina’s depiction of her mother. What does interest me are the reasons the legacy was undone by the memoir and its adaptation. The hits Crawford’s image has taken after her death are the result of something that was building up before then: a resentment of professional women. People are more brazen faulting women like Crawford as mothers and romantic partners because they openly put their careers first. In this light, her work in “Mildred Pierce” (1945) gains a deeper meaning as it concerns the price women pay for caring about their careers, the tricky emotional dynamics of the domestic sphere, and a fraught mother/daughter dynamic which predicts issues Crawford would deal with personally later in life. Joan Crawford was a good, sometimes even great actress but she was also an amazing businesswoman. 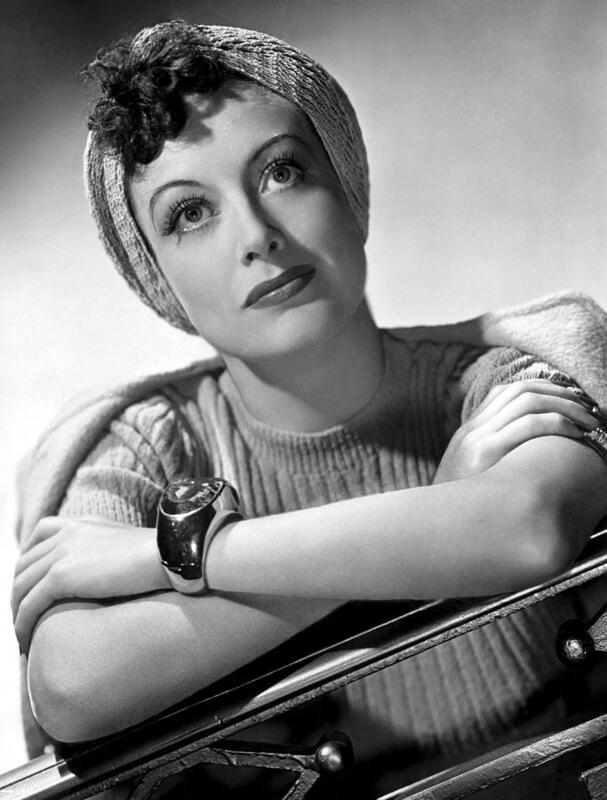 She may have come through the ranks of the MGM star machine, which changed her birth name from Lucille Fay LeSeur to Joan Crawford and made sure her freckles were never seen on-screen, but she had a hand in crafting her own image. It should be noted that the stars from this era we remember weren’t really products of the star machine in the first place and were able to retain something essential about themselves even when going through the rigors of Hollywood during their early years. Crawford pivoted from setbacks like the end of her tenure at MGM to signing with Warner Bros. and delivering arguably the best performance of her career in “Mildred Pierce." She had the uncanny skill to adjust her looks to simultaneously reflect and seem slightly ahead of whatever was the conception of the modern woman at the time. Her films particularly in the 1930s and 1940s, which often paired her with Franchot Tone and Clark Gable, showed her as a hard-working young woman on the make, able to find love and success thanks to her own intelligence and sheer will power. Looking at these roles only through Crawford’s biography do her skills as a performer, and understanding of what film actors needed to bring to the table, a disservice. But her hardscrabble, poor upbringing undoubtedly lends these roles an authenticity and edge they wouldn’t have had if played by someone else. Even after having to mount a campaign of self-promotion to get the quality roles she deserved during her early years at MGM, Crawford wasn’t the kind of star to take up issues with the studio. Unlike other actors like James Cagney and Olivia de Havilland, who rightly fought their draconian contracts, Crawford was a professional and knew her limits even as she became one of the most powerful stars in the business during the 1930s. In the “Star Machine,” film historian Jeanine Basinger offers a behind-the-scenes story about “When Ladies Meet” (1941) that illustrates this writing, “Crawford knew her own stardom depended on being professional rather than always getting the key light. She was smart about her career—and cooperative.” Basinger mentions how Crawford mutes her performance when acting against Greer Garson, who was being groomed as a star, while Crawford was already well established and a few years away from leaving MGM. Even as the production team “clearly favors [Garson]” and the politics behind her place at MGM became more fraught, Crawford was always the utmost professional. This anecdote of actresses at very different points in their careers illustrates Crawford’s own professionalism and the short shelf-life of female stars, even those as beloved and well-paid as Crawford. That Crawford was able to last long beyond this moment professionally is a testament to her own acumen. Crawford was kind to her fans, personally signing the photographs they sent to her; she knew what they wanted from her famous remark, “if you want the girl next door, go next door.” Crawford was self-aware about the beauty politics of her role in the Hollywood ecosystem. Placing her roles through the years next to each other, we can see a startling breadth of presentation. There's the flapper with the witty smile and slick bob that led F. Scott Fitzgerald to say, “Joan Crawford is doubtless the best example of the flapper, the girl you see in smart night clubs, gowned to the apex of sophistication, toying iced glasses with a remote, faintly bitter expression, dancing deliciously, laughing a great deal, with wide, hurt eyes. Young things with a talent for living.” There’s the lustful, independent dame with looser curls and tighter clothes acting against Clark Gable. Then there’s the career woman of the 1940s moving up in the world on her own, all broad shoulders and long hair. This isn’t to say that Crawford’s only or even primary worth was in her professionalism and understanding of stardom. Her career wouldn’t have spanned that long unless she was able to speak to her audience and be believable as an actress. While I love the bitchy, sly mistress she plays in “The Women” (1939) and the fluidity of her movement in her flapper roles, Crawford feels at her most transcendent in later roles. Crawford’s greatest work shares a few traits particularly in how it highlights how she used posture to indicate character. While Crawford seems like an incredible force of nature, she’s at her most captivating when actually sharing the screen with an actor that can challenge her. There’s of course Bette Davis in “Whatever Happened to Baby Jane?”, with each woman bringing a humanity and terror to their roles in dramatically different ways. But there’s also the uncomfortable mother/daughter dynamics that create the backbone of “Mildred Pierce," the garish “Johnny Guitar” that sets her against Sterling Hayden (1954) and one of my favorites, the brief moments she shares with noir staple Gloria Grahame in “Sudden Fear” (1950). Even though Grahame and Crawford barely interact, the film goes to great lengths to position their versions of femininity as dramatic opposites. There’s the lustful, underhanded fatale that Grahame plays on one side and Crawford’s rich, caring playwright on the other, who grows more and more hysterical as the film goes on. If the film was made ten or fifteen years prior, Crawford would likely have been playing Grahame’s role. Crawford shows an incredible understanding on-screen and off of the various compromises women make in trying to find success, romantic and otherwise. One of her most emotionally realized performances came later in her career in the 1956 drama “Autumn Leaves,” directed by Robert Aldrich. The film delves into mental illness and an older woman/younger man relationship dynamic. But my favorite scenes involve Crawford grappling with her own loneliness, like when she goes to a musical performance early in the film and the world seems to fade around her. The light stays on her face, her shoulders slump and she softens as she gets lost in her memories. These moments show a level of tenderness and self-reflection that contradict the wild-eyed monster Faye Dunaway played her as and her own daughter believed her to be. It may prove impossible to fully wrestle Crawford from this image or shift her legacy so that it portrays the full range of her skill and complications. It’s hard for me to choose my favorite photograph of Joan Crawford. In a career spanning four decades, Crawford provided audiences with many indelible images of womanhood even if history only holds onto one. 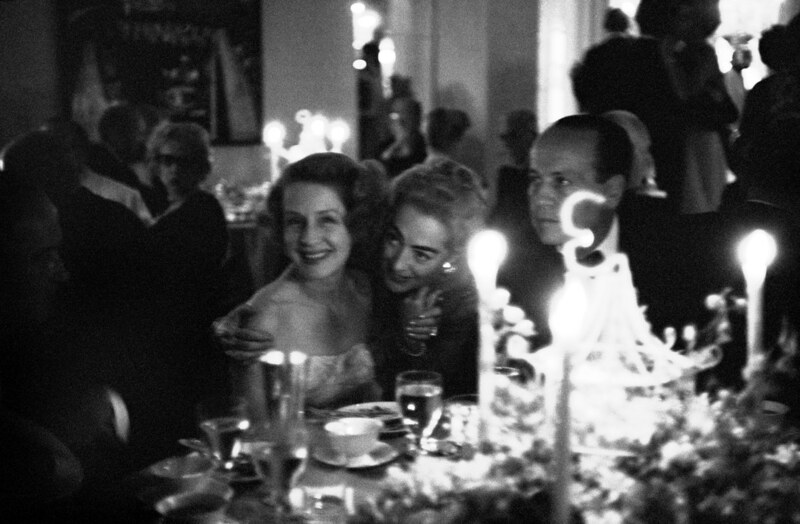 But if pressed I would pick the series of photographs Eve Arnold took in 1959. One shows Crawford studying her lines on the set of “The Best of Everything [the top photo] her hand grazing her hair in concentration. In another you can see her gazing off camera next to Norma Shearer [pictured below] her eyes alight with a smile we can’t fully see, at a party somewhere in Hollywood. Crawford was in her mid-fifties when Arnold took these pictures. The extreme close-ups of her lining her lips, or another photograph showing the casual intimacy of her in undergarments cradling the phone while speaking to her agent, could have been framed as a grotesque representation of what happens as icons age. But Arnold was a photographer of great emotional intelligence. What’s most striking about these photographs is that they express a humanity that doesn’t exist in how many remember her, thanks to “Mommie Dearest." Most of the images deal with Crawford reckoning with her own reflection—both literally in terms of the mirrors surrounding her and metaphorically in terms of how they detail her beauty process. Crawford, perhaps more than almost any female star in classic Hollywood, understood what was expected of her. That beauty and the power it brings comes with its advantages and also a price.